Come Live With Me: Living the History of a Ballad is dedicated to the study of the poem and the broadside ballad of Christopher Marlowe’s “The Passionate Shepherd to His Love” using a range of multimedia and interactive tools. 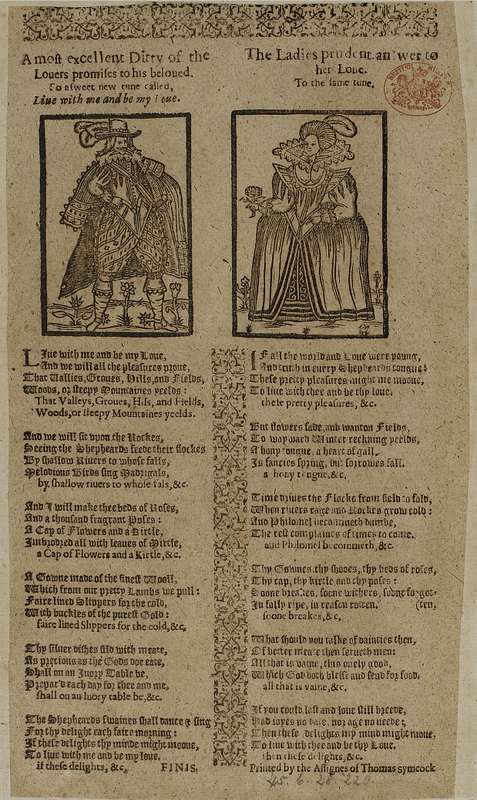 You will learn about the printing history of Christopher Marlowe’s poem, its many literary lives (like the broadside ballad pictured here), the broadside ballad’s tune and woodcuts, and the responses it continues to inspire. Whether you are familiar with Marlowe’s work or have just begun your journey, this site will guide you chronologically through the history of Marlowe’s poem and its relevance today. On the bottom of each page is a “Return To” link (this takes you back to the previous page) and a “Go To” link (this takes you to the next page). You are currently viewing the introduction to the site. The site is designed to follow the topics in the order they are listed in the menu bar, beginning with an essay on the transition from manuscripts to the printing press to show you how this transition is relevant to this project, then moving onto the poem (its printing history and analysis of the versions), the broadside ballad (looking at the broadside ballad, the tune’s history, and the broadside illustrations), and ending with the responses, replies and parodies of all genres. The last section of the site is dedicated to information about the Project background. See Site Map for a breakdown. While this site is optimized to be viewed on a mobile device, we recommended using a laptop or desktop computer. The search bar will always be at the bottom of the page, in the site footer. All the information presented on this site has been found in academic works, online resources, or was written by professors in the field, graduate students, or myself. At the bottom of each page are the footnotes. For citations, please note the user policy at the foot of the site and see Project Credits for a full list of contributors and a comprehensive Works Cited.